THIS IS THE MOMENT FOR SWEETNESS AND ELEGANCE! Partysu style- The fresh color on leather adds a sweet vibrant look to a cute wallet, you cannot miss it for the spring trip or in cool summer night out in the season of floral trend. Not too big or too small (7.3*3.9*1.8 inches)- it's perfect for everyday companion. If you are looking a nice gift for your girls, it is a must-have item, packed with a sticky card holder for mobile phone, she will be surprised to get this present. Chic and Durable- this wallet is made of good workmanship and elite soft PU leather. The attention we paid on every product details ensure best wallets to every customers shopping from FanCarry. Fashionable and Functional- coins, cards and cash will stay secure in this wallet. You will manage all your tiny things well with this smart clutch. It is a welcome choice for wallet collection. Trendy & Sweet style- a good match to the outfits, many colors available to match your young girl jacket or your elegant lady dress. 1. When stained with dirt, please wipe gently with a damp cloth and dry it in shade. If the product is deemed defective when you receive it, you can simply return to us in 30 days for an No Hassle Replacement or Refund. Material: premium soft synthetic leather, polyester lining, and gold metal finishing hardware. Appearance: 1 top zipper pocket, 1 middle open compartment, 1 front zipper pocket. 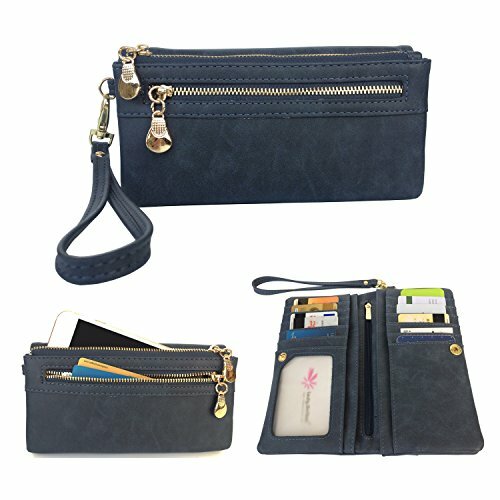 These functional pockets can organize your cellphone, receipts, change, coins, keys, some of makeups and other small items very well. Inside: 1 frosted ID slot, 11 credit card slots, 1 zipper pocket for secret paper, 4 interlayers for cash or check. Bifold and closed with snap. Strap: one removable wrist strap. You can use it as a wallet in your large bag, or just carry it with the strap as a wristlet or handbag. Size approx: L7.3 * W1.8 * H3.9 inch. Package will come with a sticky card holder for smartphone. If you have any questions about this product by FanCarry, contact us by completing and submitting the form below. If you are looking for a specif part number, please include it with your message.